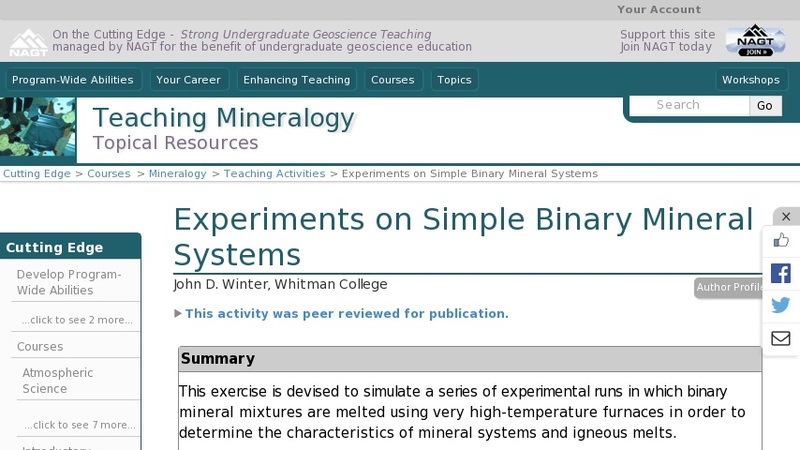 This exercise is devised to simulate a series of experimental runs in which binary mineral mixtures are melted using very high-temperature furnaces in order to determine the characteristics of mineral systems and igneous melts. Of course, natural melts are far more complex in composition, but it is surprising how much one can learn from simplified analog systems. In an experimental laboratory you begin a study by preparing mixtures of two minerals in various proportions. The minerals are ground finely and placed in a platinum crucible. Platinum (or gold) is used because of its high melting temperature and lack of contamination of the "charge" (as the sample is commonly called). The crucible is placed in the furnace and held at a specified temperature for several hours. When the "run" is over, the charge is quickly removed from the furnace and rapidly cooled in a stream of compressed air or occasionally in water. Any melt that may have been produced will solidify immediately as glass. Any minerals that may have been stable at the run temperature, will be present as crystals, either recrystallized in the solid state below the melting temperature, or imbedded in glass if some melting occurred. Several runs are repeated, using various proportions of the two starting minerals defining the system over a range of temperatures. It is also possible to determine the composition of the run products (both glass and crystalline) by cutting the charge, making a thin section, polishing the surface, and analyzing the constituents with an electron microprobe. Using data from a series of experiments, including: 1) initial mixture composition, 2) the run temperature, 3) the phases present in the resulting charge, and 4) the composition of each phase, a phase diagram can be constructed. There are several types of phase diagrams, but the most common is a careful plot of temperature versus composition (a "T-X" diagram) for all phases present at equilibrium in the run products (either solid or glass/liquid) for a particular temperature.